Hearing My Heart: Treasure Hunting in St Petersburg - Just the Start of things to come! Treasure Hunting in St Petersburg - Just the Start of things to come! Saturday 16th October saw Hope Church gathering together (with just a few visitors from South Africa!) for our first, regular Saturday time together where we'd be going out onto the streets and looking to bring God to the people. We were using the tool that is known as Treasure Hunting, a very helpful thing for us, especially those doing this sort of stuff for the first time, of which the first story is from just a lady. Before Saturday, this Russian lady had never done anything like this before. Usually we write down a number of things that we feel God has said, but Janna it seems wrote her whole sheet as if for one person.....she had the name Sasha, that he'd be dirty and sitting on a bench, that he'd also be homeless.....so when the teams went out, she went off looking for Sasha. Remember, this was her first time doing this, it's as if she thought "This is how it works!" - and it did! 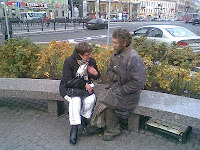 She headed for the metro station area as usually outside there are a number of homeless people begging, but at this time there were unusually very few, only one in fact. He was indeed on a bench and was very dirty. A South African man who was in this team later commented that of all the homeless folk he'd ever seen (he went on to say that there are many in SA) this was probably the dirtiest and smelliest he'd ever encountered. The man had a big beard, so that at first Janna thought she knew the man - she asked him "Is your name .....(I forget what she asked, but when it was clear he wasn't who she thought he was, she said) "then your name must be Sasha!" Over about 20 minutes he shared his life story - Janna cried because of what was said. By know she was next to him, with her arm on him. Another team member, who arrived just after the first conversations, said at first he had to stay back so as not to be sick - the smell was that bad! And yet, Janna was next to him. Janna talked with him, then clearly feeling the Spirit (remember, this is a new Christian and the first time doing this!) she said he needed to repent! She prayed a prayer of repentance with him, to which he repeated! Hope Church does not yet have this kind of rehab ministry so Janna gave him information about somewhere he could go to get sorted out. We can only pray he finds his way there. After this the same team went to a shopping area. The SA guy had some clues that were highlighting some things about a young man God wanted to speak to. They stood in the centre for about half an hour - when people would come, Mark would say "No, it's not him...." until suddenly he saw him, a young man in black with a friend. "That's him!" They talked. They offered to pray. He would only allow them to pray for him in a church building across the road, so having no problem with that, Mark led him across and into this building. The guys friend was being less helpful, so Janna took it upon herself to talk and distract him so that his friend could ask what he wanted to ask to Mark. Come Sunday morning, this man turns up at Hope Church. Oleg, one of our Russian leaders, sits with him the whole time. He gets him a coffee at the end and they sit again in the main hall. This man had understood nothing of the meeting. It was a totally new experience to which he did not know what to make. Oleg and Janna, and with Mark, explained everything to him, being patient....loving him into God's Kingdom....they led him to Jesus, praying with him. That is a day he will never forget. He then went to home group last night with Oleg and seemed to really enjoy it, though it clearly still understanding things - so praise God for this kind of break-through! These were the stand out examples from Saturday but still there were two other groups, groups that prayed with people, groups that had also been given names and appearances for people they were about to meet. A fire has started to burn here in St Petersburg. We've seen it in the last few weeks in our celebrations. We've felt it in our hearts. And now we are stepping out onto the streets, contending for so much more, trusting that God will do more than we can ask or imagine and that great things are going to happen. What started out as monthly is going to be more than that. I feel we need to do it at least fortnightly now, so will take people out with me every other Saturday, to learn together, be trained together and see God breaking through into the lives of those around us - together! God is on the move in St Petersburg. His Spirit is working, a new time is nearly upon us - it's coming!